Gena Showalter is a prolific author of romance, fantasy and young adult novels, who has published more than 25 books in the last 17 years. Her latest publication is The Darkest Captive: Lords of The Underworld. 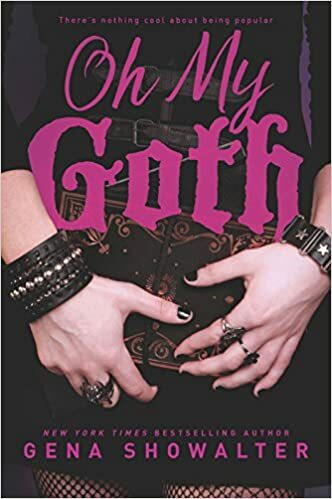 Oh My Goth was first published by MTV Books in 2006. It has now been revised by the author and republished by Harlequin Teen, released in multiple formats, including an 8.5 hour audiobook version performed by Katie Koster. Strangely, even though originally released by a publisher associated with MTV, Oh My Goth has no reference to Goth music -- no Cure, no Sisters of Mercy, no Bauhaus. That's a disappointment. The main character, Jade, is a goth in the sense that she wears black all the time and she is preoccupied with death. She rejects popularity, boyfriends, and she takes pride in seeing through the facades of supposedly normal people. It soon turns out that she nearly died in a car crash when she was a young child, and she was trapped in the car with the mangled body of her dead mother for hours. So really, her life seems to be completely based on a trauma. She is emotionally isolated from others, she is cruel to those she scorns, and she is always unhappy. The young adult novel is a fantasy story of moral and emotional transformation through a visit to an alternate reality, still in the same high school with the same people, but where her father married someone else after the accident and the world is goth-reversed -- all the "normal" people wear black and decorate their houses in austere black, and Jade wears colors. In the real world, Jade is unable to sustain close connections with others, but in this new world, she learns to love and kiss. Of course, none of this makes much sense. The plot has massive holes in it and isn't very coherent. Psychologically, Jade heals from her trauma mainly through the power of crushing on a boy, with some help from seeing how her former self was so unhappy and the rewards that come from kindness and intimacy. Nevertheless, the story moves quickly and Jade is a charismatic and funny narrator who has some good putdowns and has mastered self-defense. Oh My Goth does show some appreciation of Goth culture while also showing its limitations.